Homemade Chocolate Cupcakes with Frosting – 12 decadent chocolate cupcakes with an equally delicious homemade frosting. One of the reasons I love to bake from scratch is because I don’t have to buy anything special to make cakes, pies or cookies. I always have flour, sugar, butter, baking soda, baking powder….all the things I need to make it myself in the pantry. Let’s face it, going to the grocery store just for what you need can rock your pocketbook. When you have all the basics for baking in your pantry, you’ll find that baking from scratch can actually save you money. 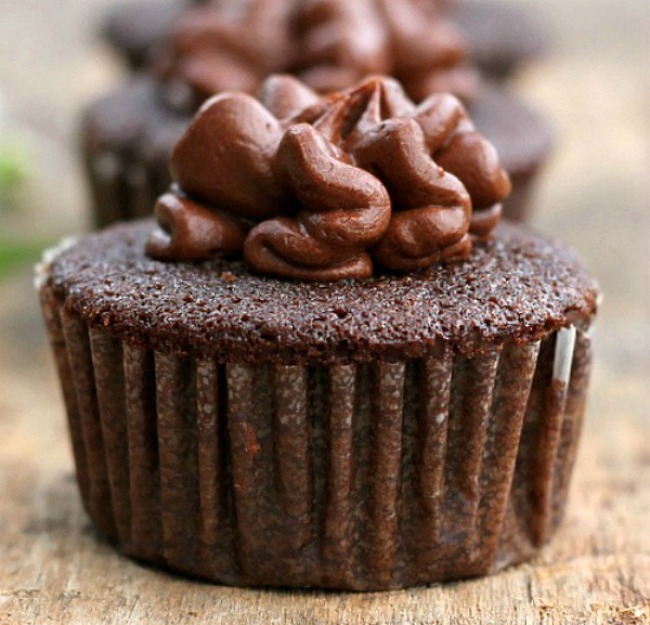 Which brings me to this recipe, Homemade Chocolate Cupcakes with Frosting. I’ve made this recipe before as an 8 inch chocolate cake, today I was in a cupcake kind of mood. I chose to make the cupcakes with this 8 inch cake recipe because we don’t need a full cake recipe that would make 24 cupcakes. The recipe yielded 12, which is a nice amount to make, eat and still have some left to share . The other reason I made it is because it uses cocoa, something I always have in the pantry. Using minimal ingredients that I already had, I made the most decadent deep chocolate cupcakes you’ll ever eat. 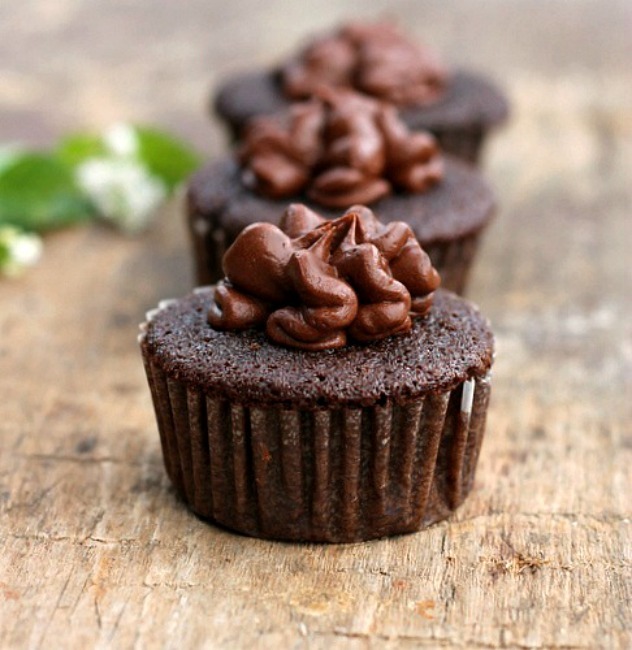 These delicious, moist chocolate cupcakes deserved to be topped with an equally delicious homemade chocolate frosting…made with cocoa. The effort of baking from scratch is worth it, not only for your pocketbook ,but for the taste alone. Homemade Chocolate Cupcakes with Frosting , you can’t beat homemade! Enjoy! Preheat oven to 350 degrees. Place cupcake liners in a 12 cup cupcake pan. 3 Tablespoons milk more if needed. 1. In a medium bowl combine the dry ingredients, flour,sugar,cocoa,baking powder,baking soda and salt. Set aside. 2. Boil 1 cup of water in a saucepan, remove from the stove and add the butter in chunks, stir to melt the butter. 3. In the bowl of an electric stand mixer, place the water/butter mixture, beat on medium speed to combine. Add the egg and vanilla and beat until well combined. 4. Add the dry ingredients to the mixing bowl, beat for 2 minutes on medium speed. 5. Spoon batter into cupcake liners about 3/4 full. Bake at 350 degrees for 15 - 20 minutes or till test done with a toothpick. Cool completely, frost cupcakes. In a small saucepan melt butter, stir in cocoa, place the mixture in the bowl of an electric stand mixer. Alternately add confectioners sugar and milk, beating until you reach spreading consistency. Add more milk if needed, stir in vanilla. Frosts 12 cupcakes. You can also make this in an 8 inch square baking dish. Grease the dish with shortening, follow steps above for batter. Bake at 350 degrees for 25 - 30 minutes, or till test done with a toothpick. The only problem I can see from these cupcakes is that they look so good, so tempting, I don’t think there would be any left for photos. Not even crumbs! Wowsa!! Could these look any better at all? The only answer is, no. Great job with these!! Thank you so much Dan!! Thank you Josie for coming back to tell me!! I love that!! Hi Bunny, I made these cupcakes yesterday for a friend who requested Chocolate Cupcakes for her Birthday. These cupcakes OMGEEEE delicious, simply & easy the best I’ve ever tasted. Thank you, looking forward to making more of your recipes. Thank you CeeCee for coming back to say you made them!! I loved them too! just beauitful! i am a fan of simple and delicious cake/cupcake recipes. Great job! Do I use Unsalted butter or salted butter? Jordan the recipe has 1/4 teaspoon of salt in it so if you wanted to go with unsalted that’s fine. I don’t ever buy unsalted butter so when I made it ,it was with salted butter. Hi, What is the difference between cocoa and baking cocoa? As far as I know Danielle they are the same. Can I follow this recipe for making cream layered round cake? You can make this cake into an 8 inch cake debalina, I have made it that way and into cupcakes. I need to make about 295 cupcakes how would you go about making them? Well Ken, I’d start by doubling the recipe each time you make it. Man that’s a lot of cupcakes!